The official version is the latest stable release made by the eMule Team. Choose if you prioritize a stable and well tested version. This application installs or updates eMule by a setup routine interactively, containing all language files. This archive contains only the sourcefiles of this release and needs to be unzipped. For developers. ED2k-Links for this version can be found here and a list of all prior releases is available on SourceForge. The community version is based on the latest official release or beta but contains additional features and bugfixes made by the community and is maintained by fox88. Choose if you prioritize a more up-to-date version. The purpose of this access module is to improve the ability of VideoLAN Client (VLC v1.0.5 ) to preview incomplete downloads (eMule part files) of video files. Because an eMule part file usually does not contain a complete media stream, VLC has to scan the entire file to find all actually available data. The process of scanning the entire file may take a rather long time, depending on the actual data available and the file size. This access module will evaluate the eMule part.met file of the corresponding part file to determine what file data is actually available. With this information, the access module is capable of creating a virtual media stream without any gaps and will feed this media stream right into VLC, and thus VLC will no longer have to scan the entire file, because it will "see" only the actually available data in the part file. More information is available in the Readme (also in the download) and in the documentation. 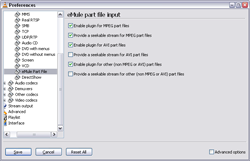 The eMule Shell Extension enables the Windows Explorer to display additional information for eMule .part.met and .part files which would be otherwise only visible from within eMule itself. The information is displayed in Tooltips, Statusbar, Detailpane and Detailview of Windows Explorer (see the attached screenshot). This Add-On allows you to make eMule search for any text you select in your browser without having to switch to eMule and retype everything into eMule's search panel. The Link Creator is a convenient tool for generating eD2k links in various formats. Especially useful for creating links with HTTP sources. Web masters: See this help topic how the HTTP links can greatly help releasing popular files. MRTG - Multi Router Traffic Grapher is a tool which displays this information as graphs in HTML documents. The Windows NT series (NT, 2k, XP, 2003) is able to log and display performance information with the built in perfmon console. eMule (v.42.1+) is also able to log some performance data in the same format as perfmon does. Please read these installation information first! Then download the installer of MRTG for eMule. MediaInfo is a project to display extended information on media files and also provides the MediaInfo.dll which can be copied to eMule's install directory to show more information on media files in the Show Details dialog. It even checks if the file extension is correct according to the file's header. Helpfiles contain a lot of useful information, explanation, FAQ and guides. Download the helpfile of your choice into the eMule installation folder! Then press F1 within eMule to start the help!